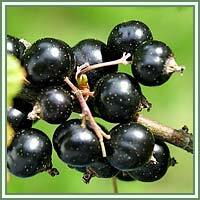 Description: Black Currant is a perennial shrub growing up to 2 meters high. It has alternate, deeply lobed and simple leaves. Leaves have five lobes and toothed margins. Flowers are small, five-petaled, growing in short clusters. They are usually red-green to brown in color. Fruit is a small shiny berry, about 1 centimeter in diameter. Berries are dark purple, almost black in color and highly nutritive. 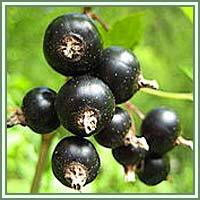 Medicinal use: Black Currant have anti-inflammatory, antimicrobial, anti-cancer, anti-oxidant and diuretic properties. Tea made from the leaves is used in treatment of arthritis, urinary dysfunctions, coughs and diarrhea. Berries are said to be effective in cases of rheumatism, gout and arthritis. Due to its high content in vitamin C, Black Currant is very often used in treatment of diseases related to the cardiovascular system. It can prevent cardiac insufficiency, vascular problems, and it can also reduce arterial hypertension. Several studies suggest that phytochemicals in the fruit have the ability to inhibit inflammation mechanisms suspected to be the origin of heart disease, cancer, microbial infections and neurological disorders.